John and Rachel at their home in East Falmouth. “Here You Are,” John and Rachel Nicholas’s new CD, which John recorded himself in his home studio, has been three years in the making and is a tribute to their 32-year journey together. The ten songs on the album, all written by John, with input from Rachel, are thoughtful and bittersweet, reflecting their growth through time, geography, music, and life’s trials and tribulations; they express, above all, their love and support of each other and their family and friends. The lyrics are intelligent and poetic, and the music, in a soulful acoustic Americana folk style, with a touch of rock and showcases both of their voices and blends the two in compelling harmonies. Rachel has a particularly warm, resonant voice, and she sings from the heart, especially in her lament about her daughter leaving home to (“I cant get in the way as she strikes out on her own”) in “Hole in This House.” John sings about America and the common man in the Guthrie tradition, about the optimism of youth and the realities of aging, particularly in “America, It’s You” and “People Like Us” and “Time Moves On,” and together they offer beautiful harmonies and strong melodies. There is a sense of sorrow or yearning to many of their songs, but there is a hopefulness too, a kind of sadder-but-wiser outlook on life. They sing about love, but not about the dizzy bloom of young love. They sing of love enduring over the years, love through major and minor crises, love amid the ups and downs of daily life. And they do it eloquently, with well-chosen poetic words that reflect their warm and generous personalities. Kind of a nostalgia or sad-yet-hopeful feel to the songs. It is a touching song that many may relate to. In “Hold On,” John asserts his willingness to help: “If troubles were stones, I’d lift yours with all my might.” “People Like Us” is upbeat and jaunty, even as it verbalizes the financial worries of everyday people. “Crossroads” reflects on the curves and bumps in the road of life. They are not your standard love songs, and all the more reason to take a listen. Originally from Long Island, John met Rachel after he moved out to California. Rachel, from Santa Monica, auditioned as a vocalist for his rock band Bakiste (pronounced “Back East”) in Santa Barbara, and they have been together ever since, despite Rachel’s vow not to date anyone in the band. John and Rachel became friends first, and that friendship has thrived and is manifested in their singing, their performances, and their lives together. After the rock band broke up, the two performed in a Latin jazz group, which opened for big names like B.B. King in the late 1970s. In 1980, John was asked to play bass on an album being recorded in New York, so they moved to Manhattan and Rachel completed her degree in art at Hunter College. By 1982, they had realized they were “not cut out to live in Manhattan,” and accepted an invitation from Chris LoCascio to “come to the Cape, paint [houses] and have a band.” They settled in East Falmouth and formed a band right away, Endgame, adding a bass player and a drummer to Chris’s piano and their guitar and vocals and played throughout the Cape. 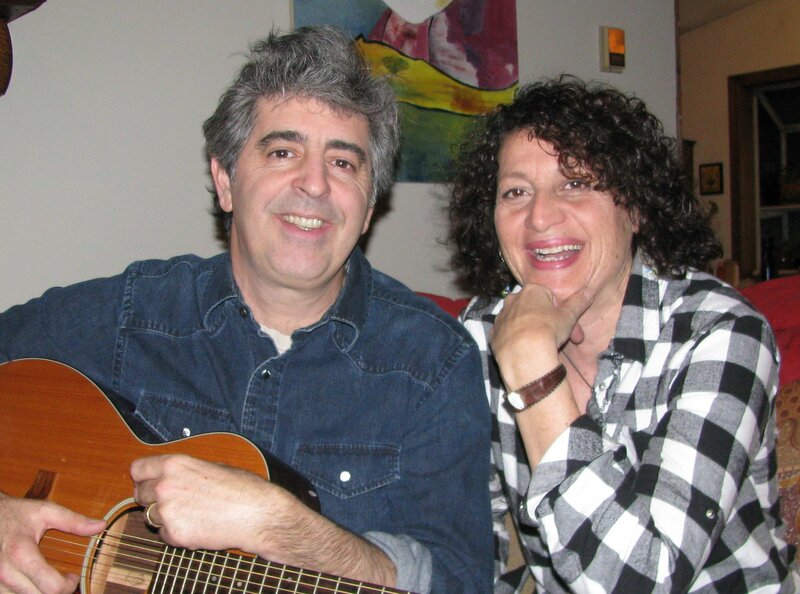 In 1988, John, Rachel, and Chris formed an acoustic American music trio, and, a few years later, John and Rachel began singing as Dreamwork, performing in coffeehouses such the South Shore Folk Music Club in Kingston, initially on Open Mike night. They opened for Aztec Two-Step at the First Encounter Coffeehouse in Eastham, and performed at several coffeehouses (the Benefit and the Driftwood) in Marstons Mills in the space currently occupied by the Third Fret coffeehouse. Last year, they performed at the Navigator Coffeehouse in East Falmouth, and recently at No Place Special in Mashpee, as well as many others over the years. I met Rachel and John about 8 years ago, when they performed with Dreamspinners, a women’s chorus created and led by Shirley D’Estete of Mashpee. The group included both singers like me who had never sung before and singers like Rachel who clearly had. Both our teenage daughters were in the chorus too, and there were several other mother-daughter pairs in the group, which focused on songs of compassion and healing. I loved hearing Rachel’s strong and passionate voice, in solos, or as part of the chorus—she contributed not only to the overall quality of sound of the group, but to the musical education of people like me. At that time they were still known as Dreamwork (The name of the chorus, Dreamspinners, was unrelated). After DreamWorks Pictures was created, “the name didn’t feel original any more,” and the duo decided to use their own names as their band name, which, they said, was more appropriate in the folk world. Their musical influences have been the Beatles (“We grew up on the Beatles. We thought folk music was ‘Rubber Soul,’” said John), the Band (“the ultimate roots band, sounding like they were coming from the Civil War”), Bruce Springstein (“We have always been Springstein fans), American fiddle music, Emmy Lou Harris, Steve Earl, and, in general, “people who sing about life and emotion,” including Simon and Garfunkel, Bob Dylan, Cat Stevens. John quoted a definition he read describing folk music as “music where the story is more important than the song,” and he is proud of the fact that the words in his songs “mean something.” He credits Rachel with coming up with some of the ideas for songs. “She is a very good arranger, and she gives good editorial advice and helps create the vocal harmonies” that the duo is known for. They have been described as “singing with one voice,” and that is an apt description of their vocal harmonies. The realities of earning a living and day-to-day life interrupted John and Rachel’s musical journey for a few years, but, in the past three years, they have returned to active singing, recording, and performing. “It is important for music and art to be seen and heard,” said John. He named his recording studio Jumping Mouse Records in honor of a native American folk tale, in which a tiny, but courageous, mouse, taking a leap of faith, jumps high in the air and becomes a soaring eagle. See FirstPeople for one version of this tale. You can hear John and Rachel’s new CD on their MySpace page, and it can be purchased at CDBaby. For more information on John and Rachel, see their website. John and Rachel Nicholas are having a CD release party on Saturday, April 10, at 7:30 PM at the Navigator Coffeehouse in East Falmouth. Tickets are $15. For more information, see John and Rachel’s site at or the Navigator Coffeehouse. They will help the Waquoit Bay National Estuarine Research Reserve (WBNERR) in East Falmouth celebrate the 40th anniversary of Earth Day on Saturday, April 24, as they have every year for the past 15 years. Performing with them will be Hugh O’Doherty and Denny Jeff Schwartz, both singer/songwriters. Admission is $10, $5 if you bring your own coffee mug. On Saturday, May 1, you can catch them at the West Falmouth Library, where they will be performing a special fundraising concert for the library at 7:30 PM. Tickets are $10. In June, John and Rachel will be performing in at the Sweet Chariot South Music Festival in West Roxbury.